FDI is an NGO with official relations with WHO. 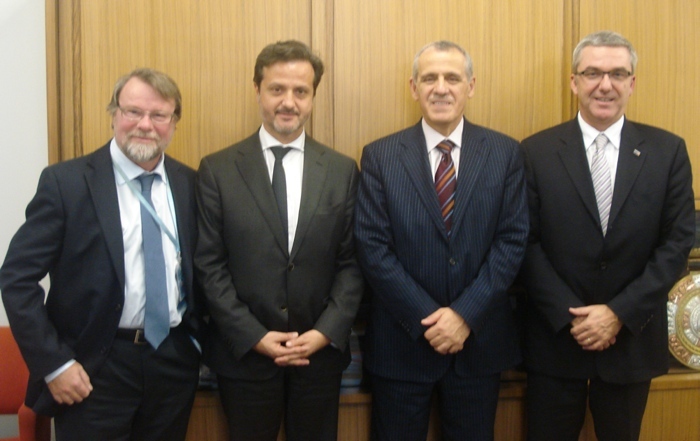 In that capacity, we had a high level meeting in WHO headquarters, in Geneva, the 21nd December. I attended it with Jean-Luc Eiselé, FDI executive director, and Julian Fisher, FDI Associate Director, Science & Professional Affairs. Of course oral health promotion was the main topic of discussion. From left, Poul Erik Petersen, WHO Global Oral Health Programme, myself, Ala Alwan, WHO Chronic Diseases Prevention and Management coordinator, and Jean-Luc Eiselé, FDI executive director. This entry was posted on Wednesday, December 28th, 2011 at 17:18 and is filed under FDI World, World Health Organization. You can follow any responses to this entry through the RSS 2.0 feed. Both comments and pings are currently closed.